Saints InterchangeDylan Roberton off due to an injury. Saints InterchangeBen McEvoy off due to the blood rule. Fremantle have made two late changes with Chris Mayne (rested) and Garrick Ibbotson (achilles) making way for debutants Craig Moller and Josh Simpson. The Saints are as named and start favourites. Koschitzke starts as sub in his swansong, while for Fremantle firstgamer Craig Moller will await the tap on the shoulder. 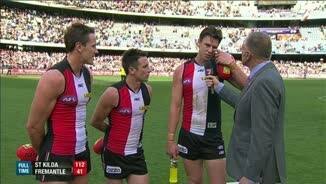 Welcome to Etihad for this peculiar encounter between St Kilda and Fremantle. The Saints farewell three club champions today while the Dockers field a virtual 'B' team as they prepare for finals. Welcome to Etihad Stadium for the St Kilda v Fremantle Round 23 clash. 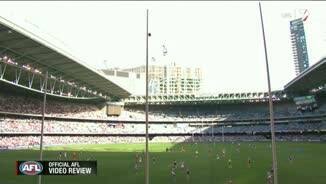 THE HISTORY books will show that 16th-placed St Kilda rounded out season 2013 with a 71-point win over third-placed Fremantle at Etihad Stadium. But the score will only tell a fraction of the tale. Fremantle left half its full-strength team at home ahead of its opening final next weekend, then left two more out before the start of the game. 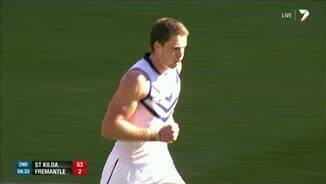 Add an injury to Clancee Pearce within the opening five minutes and the Dockers could no longer be called even a half-strength outfit. The Saints were particularly souped up for their big day, with club stalwarts Justin Koschitzke, Stephen Milne and all playing their final games for the club and in the case of Koschitzke and Adam Schneider, their 200th matches as well. 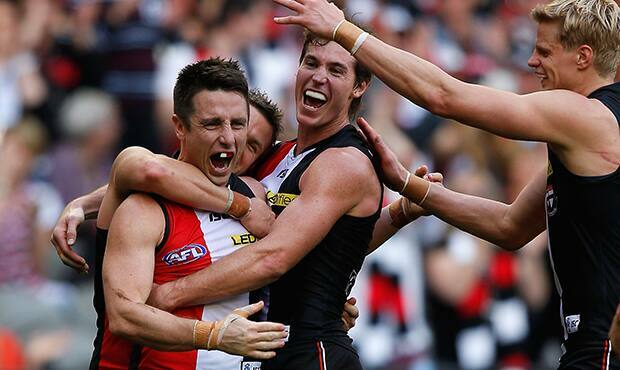 So the 16.16 (112) to 6.5 (41) by the Saints made for a bizarre afternoon at a sun-splashed Etihad Stadium. 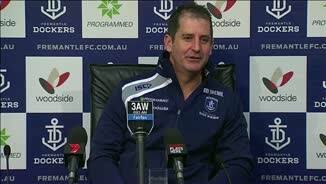 Fremantle coach Ross Lyon admitted pre-game that the late withdrawals of Garrick Ibbotson (calf) and Chris Mayne (rested) placed his team under a fair bit of pressure. And he would be proved right. The Saints jumped to a 28-point lead at quarter-time, leaving the Dockers scoreless in the process. Fremantle would enjoy a good 10-minute period in the second term, kicking four goals for the term, but was still outscored. But the rest of the match was a procession for the Saints, whose fans were out of their seats all afternoon heaping praise and love on the retiring champions. Milne would end up with two goals, and Blake one, in a rare foray up forward and both were mobbed after each goal. Blake was superb down back for the rest of the afternoon as well. Koschitzke, sadly could not end his career with a goal. His teammates went to almost ridiculous lengths to pass to him and he had several chances including one that was paid as a goal before being overturned on review. So near, yet so far, a bit like his career. 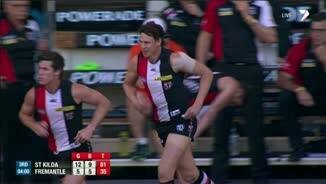 The stars for St Kilda were midfielders Leigh Montagna and Jack Steven who each had who had a club record 47 possessions, beating Robert Harvey's figure of 45. Nick Dal Santo, Jarryn Geary and Clint Jones each had 34 possessions. Dal Santo was on track for a figure in the 40s in the first half but was tagged by Alex Forster in the second half. Tom Lee kicked three goals for the Saints to underline that once he has another pre-season under his belt, he could be a long-term prospect at full-forward for St Kilda. 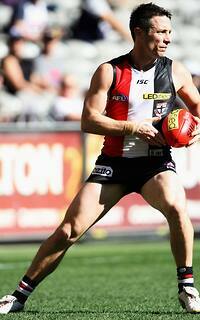 Saints coach Scott Watters said his club would not hold back seeking fresh blood during the off-season. "We certainly need to get into the top end of the draft and choose wisely," he said. Ryan Crowley and Michael Barlow did well for Fremantle but apart from Pearce, they escaped without injury, which was probably the only positive to come out of the day for their club, which will play Geelong in the qualifying final next weekend. "Our young players did well and gave a lot of effort," Lyon said. "But now they understand why we're so demanding in pre-season and from Monday to Friday. They see why we focus on preparation because there's nowhere to hide. "I thought we competed really well and we had some moments in the game. 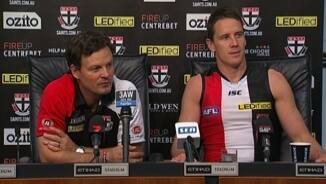 But overall, their class shone a bit," the Fremantle coach said.